Russian rabbi; born at Plungian, government of Kovno, Aug. 30, 1825; died in St. Petersburg Aug. 5, 1896. He was on one side a descendant of Mordecai Jaffe, the author of the "Lebushim," and on the other of Judah Löw ben Bezaleel of Prague and R. Meïr of Padua. He received a thorough Hebrew education and studied Talmud under Israel Lipkin. Olschwanger received his rabbinical diploma in 1845, and in the following year was elected rabbi at Tauroggen. He then devoted himself to secular studies. In 1878 he was elected rabbi in St. Petersburg, which position he held until his death. 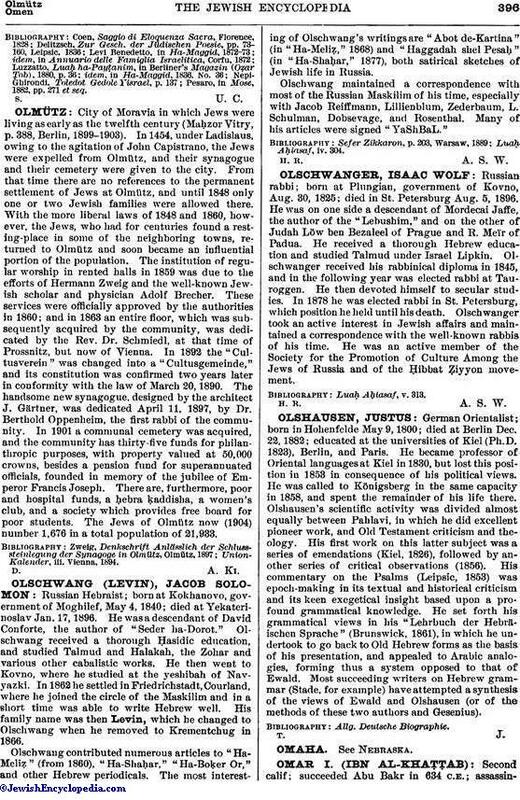 Olschwanger took an active interest in Jewish affairs and maintained a correspondence with the well-known rabbis of his time. He was an active member of the Society for the Promotion of Culture Among the Jews of Russia and of the Ḥibbat Ẓiyyon movement.